Today I had a you might be a runner if moment when I decided to wear a skirt to work and used some Body Glide to prevent my thighs from chafing. Yep, probably a little TMI, but I DO have thighs and they rub together and it was only like 97 degrees and 80% humidity today. I know...genius, right?! You can thank me later. I realized that my other you might be a runner if moment recently has been spending the majority of my birthday money on running clothes and accessories rather than work/casual clothes or other things that I might have fancied prior to becoming a runner. Runners are certainly a crazy bunch. I'm slowly but surely becoming realizing that I am just another crazy runner. It's week 2 of the hundred push ups challenge. Since I had the day off yesterday I *almost* forgot that it was Monday, but I got my push ups done right before bed! For this week, work your way down the same column as you did during week 1. After you complete week 2, take another test to see how many good-form push ups you can do. Make a note of this number for week 3! So what are some of your you might be a runner if moments? Yesterday I ran my first 10K at the Appalachian Power Festival Run. The weather forecast was calling for a few showers in the morning, but thankfully they had all disappeared off the radar overnight. The temperature was fairly comfortable, but the humidity was insane, making things a little difficult (and me ubersweaty). I was pretty excited about my new duds from Fleet Feet. Packet pickup was there the day before and they were having a sale...I just couldn't resist. Since I bought 2 items of clothing, I got $5 off, plus I had $12 on a gift card, and I had a $15 store credit built up...so I got the whole coordinating Nike outfit for $25. Score! Me and wonderful running partner, Grace! With this being my first 10K, I was really unsure about how to pace myself. I couldn't go out as fast as in a 5K, but I didn't need to hold back as much as in a half marathon. Not surprisingly, we started out too fast (miles 1 and 2 were 8:39 and 8:51 - yikes!) and had to back off a bit in the middle (miles 3, 4, and 5 were 9:16, 9:26, and 9:44 - definitely not negative splits! ), and our quick start made pushing at the end a little more difficult since we had already used up a bit of energy (mile 6 was 9:35...). Maybe not the best pacing strategy, but overall, I am really happy with how we did. I was smiling at the camera...but looked away too quick. I look a little...special. My official finish time was 55:31.7 (8:57 pace?! ), however (disappointingly), when I crossed the finish line my Garmin was only showing that I ran 5.99 miles (9:16 pace...more like it). I trust my Garmin more than the supposed length of the course, and I heard other runners griping about how the course was too short, too. So really my time would have probably been closer to 57 minutes, but I'm just going to pretend that I wasn't wearing my Garmin...whatever. I just have to remember that everybody ran a shorter course, so maybe it would just be best to compare my results with the field. There were 467 total runners, with 255 in the 5K and 212 in the 10K. I was 7th in my age group (out of 21...not bad!) and 128th overall (out of 212 in the 10K). I know the name of this recipe might be enough to turn a lot of people away, but don't let it! If you don't like meatloaf, well, I'm sorry...you just don't know what you're missing and you probably won't like this recipe (okay, I'll admit, meatloaf does sometimes resemble Friskies Paté, but if you can just get over that, it's delicious). As for the muffin part, the meatloaf is baked in muffin tins; they cook faster and 2 "muffins" is a perfect portion. Spray a 12 cup muffin tin with cooking spray and distribute the meatloaf mixture evenly (just a note, they will still stick and it's kind of a pain to get your muffin tin clean again...just warning you!). Top muffins with barbecue sauce. Bake at 450°F for about 20 minutes (or until they are "done" in the middle - or until a meat thermometer reads 160°F). For the mashed potatoes, boil red potatoes for about 15-20 minutes. Mash in a bowl and add milk, butter/substitute (I use Country Crock), garlic salt, and pepper, and combine with a hand mixer. For the veggies, mix baby carrots and sliced zucchini and squash with EVOO, rosemary, thyme, salt, and pepper. Roast in the oven at 450°F (they can be in there with the meatloaf muffins, but keep an eye on them!). I'm really not a fan of how we usually have a 30-40% chance of severe thunderstorms popping up almost every afternoon during the summer. I don't mind the rain, but it makes it hard to plan. I always pack my bag for running outside, but I also have to be ready to call an audible and go to the gym instead. We were under a severe thunderstorm watch this afternoon and the future forecast (how do they do that, anyways?!) showed that we would be getting some afternoon showers between 5:15 and 6:15, which would have been pretty much the whole time I was running. So after work I headed to the gym for a good 5 miles on the treadmill. I kicked up the pace a little bit in the end and it felt great, but my stomach was not too happy about something and my treadmill didn't have a fan (let's just say I was a little gross). After I was done, I wasn't really all that surprised when I walked outside and everything was dry as a bone, and it has yet to rain. I guess that's just how we roll around here. Based on the number of push ups you were able to do in the initial test, choose the appropriate column at the top and work your way down throughout the week. I'm planning on doing mine on Monday, Wednesday, and Friday. This morning I met Grace for a nice 7 mile run on the greenway in preparation for our 10K next weekend. This was the first run of the season where we actually felt a little uncomfortably hot, even in the morning. It really zapped our energy and slowed us down! Since I never really started doing long runs until last fall, I'm not quite used to running in the heat and knowing what to expect. I hopped on over to Runners World to read some articles and before searching for anything I noticed that the Ask Coach Jenny column this week was Running in the Heat: Nine Tips to Keep Your Cool. Basically, running in the heat is more difficult, but our bodies will acclimate. It's okay to slow it down a little bit and take walking breaks to avoid exhaustion. It's important stay properly hydrated, run at cooler times of the day and in places with shade, and be attuned to any signals your body is sending you (dizziness, light-headedness, cramping = no good!). Coach Jenny also recommended wearing loose-fitting, light colored clothing, sunscreen, and sunglasses. I would also recommend a hat or a visor. I also love keeping a washcloth in my car and soaking it with water to help me cool off (and clean up!) after a long run. Grace and I talked about our plans for possibly probably running in the Richmond Marathon this fall, so we'll definitely be running a lot in the summer heat! This week I tried a new recipe from Real Simple for Chicken with White Beans and Tomatoes. As the creative title suggests, it’s chicken…with white beans…oh, and tomatoes, too! Not only was it tasty, but it was really easy to prepare and the best part was that it only dirtied the dish that it baked in. I made a few changes to the recipe based on preferences and the ingredients I had on hand. Instead of bone-in, skin-on chicken thighs, I used boneless, skinless chicken thigh cutlets (I believe the package said it was 1.7 lbs.). Also, I used dried spices instead of fresh and used minced garlic instead of whole cloves (though I didn’t measure - sorry…just add to taste!). The amount of salt the recipe called for also made the beans/tomatoes a little too salty for my taste, so I will probably reduce that amount in the future. The recipe made about 5 servings with my changes. I would also recommend serving this with some more veggies or a salad. Below is the original recipe with my changes noted in bold. In a 9x13 inch (or some other large) baking dish, toss the beans and tomatoes with the thyme, oregano, garlic, red pepper, 1 tablespoon olive oil, ½ teaspoon salt (maybe a little less), and ¼ teaspoon black pepper. Pat the chicken dry and place on top of the bean mixture, skin-side up. Rub with the remaining tablespoon of oil; season with ½ teaspoon salt and ¼ teaspoon black pepper (and thyme and oregano). Roast until the chicken is golden and cooked through, about 35-45 minutes. Sprinkle with the oregano leaves (or not if you put it on the chicken prior to baking). Does anyone know why the gain/loss are different when I started and finished in the same place? Shouldn't it technically be the same? 100 Push Ups Challenge: Who's With Us? As I mentioned, I stumbled across the 100 Push Ups Program recently. I forced convinced Andrew to do it with me and last night we did our initial test. For the initial test, you just have to see how many push ups you can do while still maintaining good form. Then look at the chart to see which category you fall into and make a mental note of how many push ups you were able to do. The purpose of the initial test is to help you decide where to start in week 1. It will also be nice to look at that number and see how much you have progressed after the 6 week program. To make sure that you can complete the program, feel free to do regular push ups, "girly" knee push ups (nothing wrong with those! ), or even just push ups against a wall. We were both able to do 20 regular push ups without feeling like our arms were going to give out or blood vessels were going to pop out from our face. I'm *hoping* to be able to continue doing regular push ups, but I will resort to doing "girly" push ups if I have to in order to finish the program. So, who's willing to take on this challenge with us? Do the initial test and let me know how you did! We'll start week 1 next week and do push ups on Monday, Wednesday, and Friday. It shouldn't take more than 10 minutes each day, and you obviously don't even need a gym membership to participate! I'll try to post the weekly schedules on here, but you can also check it out at http://www.hundredpushups.com/. Once again, I wasn't planning on running today but I did anyways (isn't it usually the opposite?!). I had planned on taking the day off and doing some weights at the gym, but the fact that today was looking like one of the only days this week that it's not going to rain, and the fact that I got a text from Grace asking if I wanted to run - I just couldn't resist. I thought I'd be a little tired but I wasn't! We got in 4 miles in just under 40 minutes. It's crazy how much faster the miles go by when you have somebody to talk to! Sundays are usually rest days for me. Not only do I like to give my body a chance to recover from Saturday's run, but I usually don't have time to run between church and doing everything to prepare for the week ahead. But for some reason, today was an exception. After church and lunch I went for a run so that I could eat more donuts later because I miraculously had both the time and energy to go running. I ran in a hilly neighborhood and I actually ended up running farther than I did yesterday. I ran 7 miles in 1:11 (10:08 pace), which isn't bad considering all of the hills (600 feet of elevation gain). It felt good to push myself and I remembered that I promised myself that I would continue to train with hills. I truly believe adding in hill training made me a much better runner, and I need to keep that up. My family must know I enjoy running now because I also got a Fleet Feet gift card from my brother and a really nice Under Armour shirt from my in-laws. This afternoon Andrew and I redeemed a Groupon we had for Blue Collar Joe's on some sinfully delicious gourmet donuts. Thankfully I was able to make it to the car before stuffing one in my face...y'all, these donuts are flippin' AMAZING! We got quite an assortment of donuts, and I'm pretty excited about trying the Blueberry Pancake Breakfast, which is a blueberry donut with maple icing and bacon dust. Yep. Bacon. On a donut. Awesome! All I can say is thank goodness I went running this morning. Foodie Friday: Best Cheap Pasta. Ever. I love pasta. Really, I just love carbs, period. I'm glad I'm active so that I can eat my fill of them (I know, I know, in moderation...). We eat some kind of pasta at least once a week, and this is one of my staples. I love this pasta dish. Andrew can confirm this because we have it all the time. It’s incredibly cheap, delicious, and really easy to make. Don’t let the entire stick of butter scare you away. If you think about it, this makes about 6 servings, so just remember that you are only eating 1/6th of a stick of butter (which is my way of rationalizing that it’s not that bad for me...). Melt the butter in a skillet and add the tomatoes and onions. Cook for about 30 minutes on medium-low heat and stir occasionally. Cook the pasta according to the package and serve the pasta with the tomato sauce on top. A little bit of sauce actually goes a long way once you stir it up with the pasta. Total price = $4.00. Price per serving = $0.65. I don’t see why people eat out. This would probably cost you a good $12-$15 at some fancy pants restaurant. Reason #523 why I love my Garmin Forerunner 305: I'm a data nerd. I love analyzing my runs. I like to keep tabs on my mile times. I like to look at how my heart rate increased as my speed increased. I like looking at elevation. I like seeing what streets I ran down or looking at the pictures I drew while running. I could really go on and on. The watch works by acquiring GPS satellite signals to track your movements, so obviously it doesn't work so well when it's raining or really hot/cold outside and I opt for the treadmill. Now, I know what you're thinking...um, hello! The treadmill tells you how far and how fast you're going, duh! Yes, but I don't have my precious data! All the treadmill can give you is a total time and a total distance, so you'd never be able to track things like intervals, for instance. That probably doesn't really matter to most people, but for a data nerd like me, it's kind of a big deal. So alas, the Garmin Foot Pod. My wonderful hubby got it for me for my birthday, so yesterday I was that girl in the gym running on the treadmill with her ginormous GPS watch and foot pod on. I also used my heart rate monitor so that I could get even more data! (insert nerd laugh/snort). So as you can imagine, I was pretty excited when I plugged my watch in and I could look at all of this (click to view larger). In other news, I'm looking to acquire a few new running toys with some of my birthday money. One of the things I want to get is a dorky fanny pack running belt so that I can have something to carry my cell phone in while I'm running. I don't love carrying my phone because it's heavy, but I definitely feel much safer knowing I can call somebody if I need to. Plus if I start getting into running longer distances more regularly, I might need to keep some pretzels or extra Gu Chomps handy. I'm currently debating between the iFitness Ultimate Running Belt, the SPIbelt, and the Nathan Shadow Pak, but of course I'm open to anything. 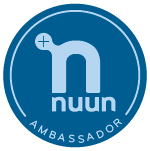 Todayz Run is doing a SPIbelt Giveaway, so maybe I could win one of those to try out! I posted last week that the entry fees for the 2012 Blue Ridge Marathon and Half Marathon were half off through tomorrow (use "I love rain" at checkout), but I wasn't sure if I should sign up for the full or the half. Well, I decided to be economical and go for the full. Who knows where I will be in another whole year? I'm pretty sure at this time last year I couldn't have run a 5K, and certainly not without stopping. I mean, why not? Will I run it? Maybe. Will I be to stubborn to drop down from the full to the half? Probably. Then again, signing up for a race is a really big motivator, so who knows. At least I got a good deal! Dave Ramsey would be proud. My run this past Saturday had to be squeezed in early and quickly before heading out of town for the weekend. This was my first “long” run since the race and I was actually pretty excited about it, minus the fact that I was a little exhausted from my first week back at work after vacation. Andrew decided to go cycling while I ran, and it was a good thing because we probably both would have opted to sleep in if we were going solo. 7:30 is a sacred time on Saturday mornings. Most people are still asleep, and without a doubt even less people are up and out running. The weather was beautiful; there was a comfortable chill in the air, the sun was shining, and it wasn’t windy at all. The birds were singing and the sun was dancing off the river and the lush green trees along the greenway. Perfect. I wish I’d had a camera with me but then I probably wouldn’t have been doing much running! I thought I only had time to get in 6 miles, but half way through I decided to kick it up to 7 since my pace was decent and one more mile wouldn’t take that much extra time. I started out a little too fast but slowed it down (on purpose) by mile 3, then made an effort to gradually run faster and finish strong in the end. I got in 7 miles in about 1:06 and kept an average pace of 9:25, probably my best pace for a long run so far (granted this was a shorter long run, but still…). I’m definitely noticing that I’m getting faster, and that makes me happy. Yesterday I mentioned that I was going to the Strawberry Festival today. My strawberry shortcake was everything I thought it would be: amazingly delicious. My run today made up for the sluggish runs I've had since the race. It reminded me of why I love running. Not only was it a beautiful day outside and I was just getting to enjoy creation, but I felt free, powerful, and accomplished. I had only planned on running 4 miles, but at mile 3 I decided I could comfortably bump it up to 5 (good thing, too, since I'll be stuffing my face with strawberry shortcake and ice cream at tomorrow's Strawberry Festival). I think one of the reasons some of my recent runs haven't been great is because I've started them out by trying too hard. It's easy to do, and especially easier to do in a race. It's actually better to do exactly the opposite and finish faster and stronger than you started. Starting out slow lets your body warm up and prevents you from burning out near the end of a training run or race. This technique is referred to as running "negative splits". Each mile (with the exception of mile 4) was a little bit faster than the last. You would think this would be super tough, but I honestly felt better about this run than my past few when my pace was all over the place. Plus it's a great mental boost to finish a run strong and give it all you've got. Here's some more information from Runner's World about running negative splits. Click here to make your own wordle! 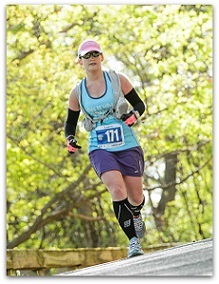 I just signed up for the Appalachian Power 10K on May 28, 2011. At just $21 (no processing fees! ), it's a great deal, plus you get a technical t-shirt! Not up for the 10K? They have a 5K, too! The run is part of a number of events associated with Roanoke's Festival in the Park. There are several activities and attractions going on all weekend to include an arts and craft show, entertainment for kids, and concerts in the evenings. Andrew and I are planning on going to the Emerson Drive and Steel Magnolia concert on Friday night. Tickets are only $11 in advance, or $14 at the door. Just a week after running in the Blue Ridge Half, Andrew and I went on vacation to Holden Beach, NC. The trip was so relaxing! We went on 2 long bike rides and I went running only once during the week. I think I was still recovering from the race a little bit and it was miserably hot outside when I was running, because I felt just awful! It was one of those runs where I couldn't quite catch my breath and it made me feel like I wasn't a very good runner. I had to take 3 long walking breaks over 4 miles...and I'm pretty sure anybody watching me huffing and puffing down the road would have never guessed that I had just ran in a half marathon a week before! Then I had to remind myself that it doesn't really matter how fast I go or how many walking breaks I need to take. I also remembered that everyone has days when they feel tired or sluggish. And further, I was on vacation! Once we got back from vacation I was ready to redeem myself from such a terrible run, and I ran 4 miles on both Sunday and Monday. I still took a few walking breaks (hills! ), but I definitely felt much better! I just wanted to update some stuff about the Blue Ridge Half. A day or so after I posted my report of the race, they organized the race results into age groups. Now, I know most people wouldn't get so excited about anything below 3rd place in an age group, but I'm very excited that I was 8th (out of 22) in my age group of 20-24. And overall I finished 163rd (out of 372). One of the main reasons I'm really proud about this is because I always feel like I'm a slow runner who finishes towards the back of the pack...but not this time! I was actually closer to the front of the pack than the back! Woohoo! They also posted pictures taken along the course. Not that I would have bought any pictures anways because they are ridiculously expensive, but man, I need to work on smiling for the camera a little more because I don't look like I'm having any fun at all. My finish line photo wasn't even that great. Oh well! Maybe I can try for some better pictures next year! Which brings me to my next point... now through May 10, the entry fee for the 2012 Blue Ridge Marathon and Half Marathon (tentatively set for April 21, 2012) is HALF off! Just enter the code "I love rain" when signing up and get into the full marathon for only $40 and the half for only $32.50! That's a sweet deal! Click here to register now. Now I just can't decide...should I sign up for the half or the full? I have serious doubts about whether or not I could do this full. I can always drop down from the full to the half, but I wouldn't get a refund in the price difference. But since the price of the full right now is cheaper than the regular price on the half, it is quite tempting. And who knows, maybe signing up for it could be enough of a motivator to actually do the full?